First off, I forgot to put Matt Taylor's name on the travel roster last night in my sleepy state, but he is here. Secondly, the team just returned to the hotel after an hour long training session at the Silverbacks stadium--well, at a training pitch next door anyway. 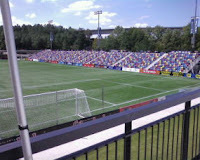 From behind the goal, here's one side of the Silverbacks stadium. It's currently in phase one of construction, as they hope to add a big deck of seating on the other side, build up a press box, banquet areas, and build a fitness center just beyond what you're looking at now. And here's the other side. From what I was able to deduce, my broadcast location will be at this level, in the corner. You can kind of see the interesting seat pattern...supposedly there is only one place where two seats of the same color sit side by side (and that was some kind of prank by the builder). The effect reminds me of the Estádio Municipal de Aveiro in Portugal, one of the stadiums from Euro 2004. Here's the team at training today on one of the side fields. You can kind of see it to the right, but there's a bit rock outcropping that was cut away to make room for the field, and at it's highest point it creates a dramatic effect, much like the Estádio Municipal de Braga from Euro 2004 (I'm a nerd for stadiums...sue me). Sounds like we'll spend the rest of the day laying low, maybe go see a movie. 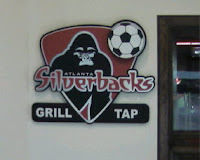 Tonight is a team meeting where we'll get a good scouting report of the Silverbacks, which I especially am looking forward to since statistics and biographical info can only tell you so much about an opponent. Have a great broadcast. 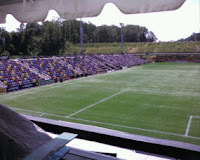 Tell the boys that approximately 15,000 fans (give or take 14,800) will be packing into Slabtown to watch their effort. I haven't been able to think about much this week outside of "TimbersTimbersTimbers" and similar thoughs. Have fun tomorrow and bring us back a lead! The eyes of Portland are upon you. Seriously, how could y'all watch a movie? I wouldn't be able to pay attention i would be so nervous! Good luck...Good announcing....& go OSU...errr..I mean GO Timbers. Tell the lads to bring back a lead to fortress PGE! Also send our congrats to Wicks, Cam and Scot and tell Leo and Justin that we all know they got jobbed! Tommorrow night there will be thousands watching! tell andrew congrats as well! We will see them Sunday and rock out with our scarves out! "It was a war out there"